European Southern Observatory - Solar System Planets And Moons Section. European Southern Observatory have photographed two galaxies. European Southern Observatory have photographed Galaxies. Tiny Epimetheus Outside the Rings. Saturn's small Moon Epimetheus is seen here just beneath the planet's ring plane. The bright, knotted core of Saturn's F ring is visible, with thin, dusty strands on either side. Epimetheus is only 116 kilometers (72 miles) across, and part of it is illuminated by reflected light from Saturn. Cassini took this image on June 20, 2005 when it was 1.8 million kilometers (1.1 million miles) from Epimetheus. With Discovery's return to flight complete, NASA is counting up the accomplishments for this shuttle mission: 14 days in space, three spacewalks, all four space station gyros returned to service, high resolution images of launch and in-orbit, and the first spacewalk to the underside of the shuttle. Discovery will now be ferried back to NASA's Kennedy Space Center in Florida atop a modified Boeing 747 aircraft. Since we're inside the Milky Way, it's impossible for us to see what our whole Galaxy looks like. But we can look at similar Galaxies and get a pretty good idea. Astronomers from the European Southern Observatory have photographed two Galaxies - NGC 4565 and M83 - which are very similar to the Milky Way. NGC 4565 is perfectly edge on, so we can see the central bulge. 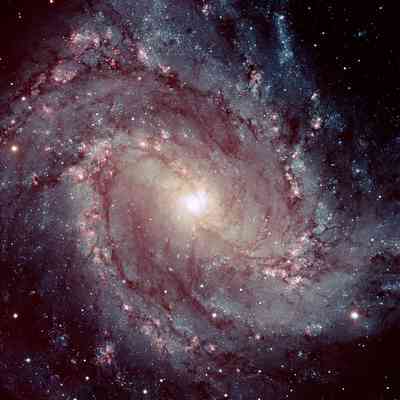 M83 is face on, so we can see its magnificent spiral arms and central structure. Mars Orbiter Ready for Thursday Launch. After a one-day delay, NASA's Mars Reconnaissance Orbiter is ready for launch on Thursday, August 11. The first launch window opens from 1150 to 1335 UTC (7:50 to 9:35 am EDT). If the spacecraft fails to launch during this period, there will be additional windows every day through August. It's expected to arrive at Mars in March 2006, where it will perform a series of aerobraking maneuvers for a full half-year before it arrives in its final science orbit.